Excalibur. Narsil. Stormbringer. Shieldbreaker. The Vorpal Sword. Lauralee. These are mighty swords of power and legend, of myth and song, blades that shall be remembered until the end of time. The following blades, however, are probably best forgotten. 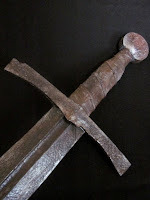 Not every sword can be an artifact of immense power. Not every sword is even a boring "long sword +1." And not every sword can be cursed. Some swords, despite their enchantment and pomp and circumstance, are merely, "meh." The grey, rough blade of this sword chips and splinters easily. A fine powder - like iron filings - flakes off it almost constantly. When it's first found in its scabbard, if it hasn't been used in awhile it's probably even covered with a layer of rust and corrosion.